Spend an exciting family activity week Portugal on the beautiful, unspoilt Alentejo coastline. Staying in apartment style rooms, the hotel is perfect for families with swimming pools, children’s playground, mini-golf and tennis court to enjoy after your day’s activities.Choose from canoeing and orienteering, surfing, lagoon activity day, canoeing and cycling, zip wire and abseiling wall. Activities are suitable for children aged 8 years and up. Prices from £775 including flights from the UK and staying in a 1 one bedroom apartment sleeping four. Some meals included. Equipment, tuition and supervision from fully qualified instructors. Final cost of holiday dependent on number of activities. Holidays depart during the Summer. 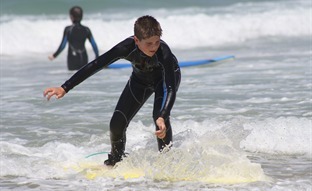 Family Multi Activity Week in Portugal – Atlantic Coast.